If you have something to say about the neighborhood you live in, one of the greatest forums you can join is your local community board. 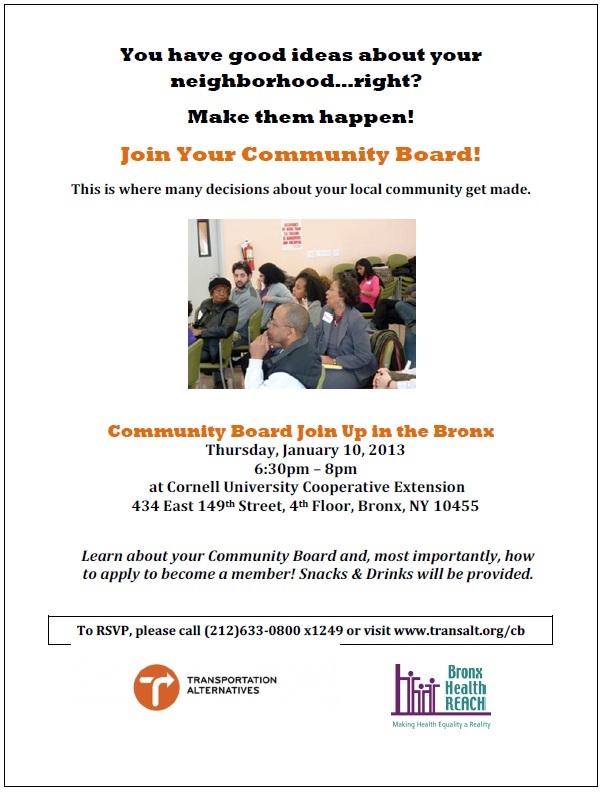 This Thursday, Transportation Alternatives and Bronx Health REACH are hosting a FREE informational session, Community Board Join Up, where you can learn about your community board and how to apply to be a member. Hear from the Bronx Borough President’s office about just how integral community boards are in the decision making process within their neighborhood. Enjoy snacks and drinks while meeting like-minded New Yorkers interested in joining their community board. You can fill out an application while you learn about the process. This Community Board Join Up will happen in the Bronx, but anyone is welcome to attend. This entry was posted in Blog, Citywide, Events, Opportunities, Take Action! and tagged be heard, Bronx, Bronx Health REACH, community boards, free, neighborhood, speak up, Transportation Alternatives. Bookmark the permalink.